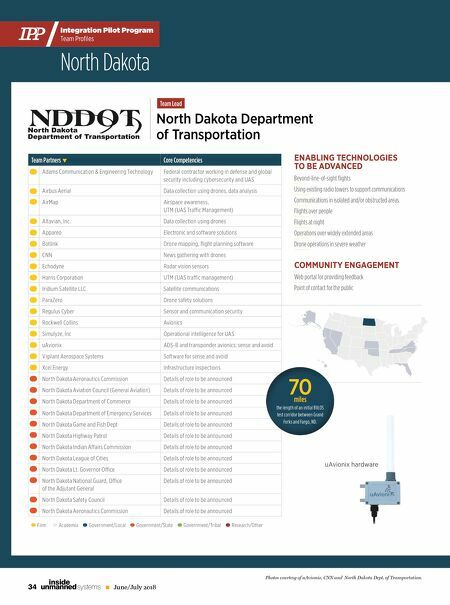 35 June/July 2018 unmanned systems inside Russ Buchholz UAS Integration Program Administrator North Dakota Department of Transportation 701-328-2561 • rjbuchholz@nd.gov Team Contact Team Partners Con't Core Competencies North Dakota State College of Science (NDSCS) Details of role to be announced North Dakota State University Details of role to be announced Pittsburg State University Details of role to be announced University of North Dakota Details of role to be announced The Turtle Mountain Band of Chippewa Details of role to be announced Grand Forks Regional Economic Dev. Details of role to be announced Northern Plains UAS Test Site Research support and testing University of North Dakota Research Institute for Autonomous Systems Details of role to be announced DRONE APPLICATIONS TO BE DEVELOPED Applications to reduce traffi c- related deaths and injuries Emergency management support Inspection of oil pipelines and other infrastructure Statewide applications including search and rescue Emergency response for quick data gathering Bridge inspection of multiple bridges in one fl ight Firm Government/Local Government/State Government/Tribal Research/Other Academia + A ScanEagle drone at the University of North Dakota. The University of North Dakota off ers a degree in unmanned aircraft operation plus engineering facilities (above right). 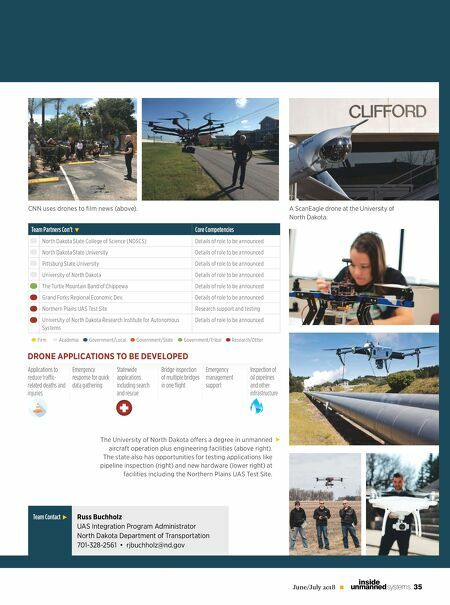 The state also has opportunities for testing applications like pipeline inspection (right) and new hardware (lower right) at facilities including the Northern Plains UAS Test Site. CNN uses drones to fi lm news (above).